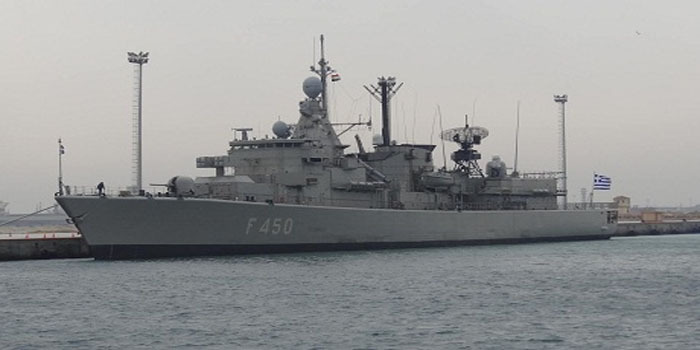 The Egyptian, Greek and Cypriot armed forces started on Monday the joint naval and air exercise Medusa-8 in Egypt’s territorial waters in the Mediterranean, a statement by Egyptian military spokesperson Tamer El-Refai said. The drill, which will last for several days, aims to boost military cooperation between the three countries “in the framework of the annual plan for joint exercises by the [Egyptian] Armed Forces to promote and support military cooperation with brotherly and friendly countries,” the statement said. Taking part in the exercise are the Egyptian Navy helicopter carrier ENS Anwar El-Sadat, a Type 209 submarine and a number of F-16 jets. The exercise is one of the most important drills in the Mediterranean, and reflects the level of cooperation among Egypt, Greece, and Cyprus.